Review of Island of Blood. At many points in Anita Pratap’s first book, Island of Blood, the pace is as taut and desperate with tension as a good summer thriller. Her adventures include spending days tracking through Sri Lanka’s hot steamy jungles, braving the snakes and the bullets of the Indian army; exposing herself to the wrath of the Taliban militia when she ventured into Kabul in a burqa, knowing that soldiers would have shot her to death if they knew she was an Indian woman and a reporter to boot; and witnessing the frightening spectacle of a frenzied mob destroying Babri Masjid. What gives the book solid emotional heft are Pratap’s moving stories of the people she encountered while on her travels. By grounding her escapades with chronicles of the ordinary people whose lives were being tragically transformed by ruthless political leaders, she draws a painful portrait of the price paid for violence. Although the book has a tendency to hop from one situation to another rather rapidly and is dotted with self-praise, by combining her journalistic reports with interviews of local people and scenes from her personal life, Pratap punches her memoir with comedy and drama, allowing the reader to have an intimate glimpse into the workings of a war reporter. 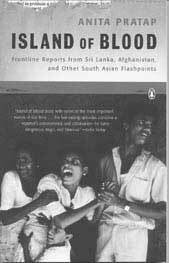 The heart of the book focuses on her work in Sri Lanka, perhaps rightly so, since that is where she gained an international reputation for being an intrepid journalist who had gained access to one of the world’s most feared guerilla leaders , V.Pirabhakaran, the brain behind the operations of the Liberation Tigers of Tamil Eelam (LTTE). There is a humorous passage in the book where Pratap describes her disenchantment at her first sight of Pirabhakaran at a meeting in Madras. Having watched LTTE video documentaries where the guerilla chief, in army fatigues with a machine gun, looked tall and tough, she doesn’t even recognize the short, stocky, soft-spoken man who walks into the room and announces that he is Pirabhakaran. Pratap accounts of her various meetings with him in India and Sri Lanka are etched out in detail, although not in chronological order, but they give a real glimpse into the personality of an underground leader who commands utter loyalty from his followers. Through her reports, Pirabhakaran evolves from a charismatic young Eelam revolutionary called Thambi (Tamil for younger brother) in the 1980s to a ruthless, military commander reverentially called, Annai or elder brother. In one chilling scene, Pratap watches Pirabhakaran deliver a threat to the Indian army where he promised to kill Indian soldiers if even one LTTE boy was hurt. Likening his unblinking stare to a king cobra on the verge of striking, she notes that Pirabhakaran had “gone taut, all ready to spring.” But the snake could turn and bite one of its own too, as Pratap reveals, when she describes the downfall of Mahatiya, his once second in command. Because Mahatiya was suspected of advocating peace, or of being close to RAW, he is reported to have fallen from grace. Pratap describes talking to Mahatiya for the last time at one of her meetings with Pirabhakaran. She is appalled to see him stand before them with folded hands and humbly assert that he was fine. “Gone was the swagger, the confidence, the muscular machismo,”she writes. Mahatiya was supposed to have been executed soon after. Pratap’s accounts of her reporting in Afghanistan do not center around a person or even a group. Here she gives us vignettes of ordinary people she bumped into while traveling with a CNN camera crew, and their brave optimism in the face of despotic rule. Mateem, a vegetable seller in Kabul’s streets was caught in the panic of fleeing citizens. Mateem manages to get on to a gasoline truck that is leaving the city but the truck explodes when it is hit by gunfire. Mateem survives, but his skin is burnt off. Pratap stops by his bedside in a Kabul hospital a few days later, where, with his entire body covered in bandages and moaning in deep pain, Mateem tells her that he hopes peace and freedom will come to his land soon. In an orphanage, Pratap talks to Dilfor, an old widow who is so poor she cannot even afford a burqa, the requisite garment for a woman who went out of her house. Dilfor comes to work in the orphanage because she has no choice. How will she eat? Every morning, she stops and hides in alleys, watching for the turbaned heads of the Taliban soldiers, in a grotesque game of cops and robbers, to sneak into work. She knows that if she is caught it will be death for her, but in the meanwhile, she dies every day with the fear of being seized as she runs back and forth from home. The tension takes its toll on her. “She was startled by anything and everything.” comments Pratap. The reports on the ethnic wars in Ayodhya and Bombay, and the utter devastation that natural calamities wrought in Bangladesh, Killari, and Hazara are equally disturbing in its range of human suffering. Unlike a newspaper report where the eyes can turn to another page and allow the mind to wander away from painful story, Pratap pulls readers deeper into the scene, giving voice to the hundreds and thousands of common people who suffer the consequences of neglect and exploitation, whether it is of women suffering under the Taliban or the prospects of being burnt in a dowry death episode, families facing death by starvation in an earthquake or cyclone, or being swept away by a rain-swollen river. While the book could have benefitted by chipping off the some of the adjectives that overstate the obvious , Pratap reveals that as a war correspondent, she was able, under some of the harshest conditions, to deliver a heartbreakingly clear ring side view of some of the world’s most tragic events in our times.